Is it done yet? 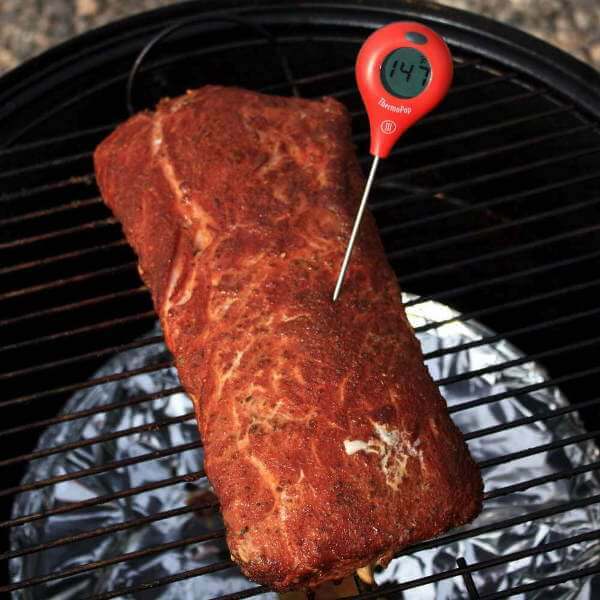 It's tough to know if you're not using a smoker thermometer. Without a remote thermometer to measure both meat temperature and smoker temperature, you're flying blind. To find out if your brisket or pork shoulder is done, you have to open up the smoker and check with a handheld thermometer. And that releases a lot of heat, extending cooking time and requiring that you smoke your meats longer than necessary. You're living on the edge if you happen to serve under cooked ground meats and poultry to your friends or family. Salmonella, e-coli and other nasty bugs that are sometimes present in those meats need to be cooked to death. Literally. That doesn't mean that the meat will be overcooked, but that the food has to reach a temperature (165˚F) that destroys those gut-wrenching germs. So having at least one thermometer is important. The peace of mind you get when knowing that your smoked meats are safely cooked is an important reason to own at least one quality meat thermometer for your smoker. 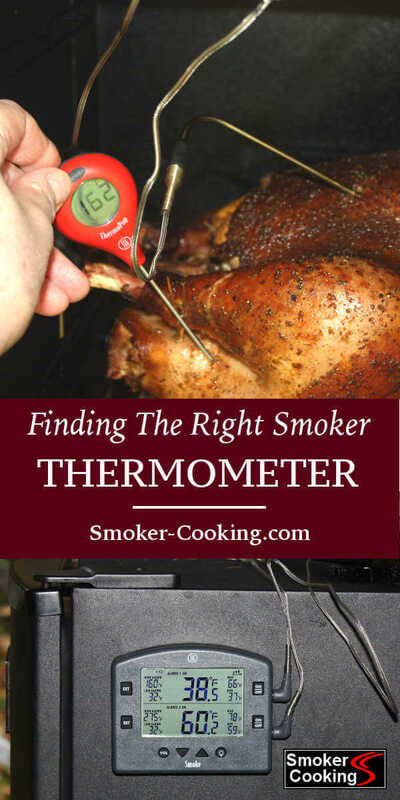 Why Own a Smoker Thermometer, and What Type Is Best? 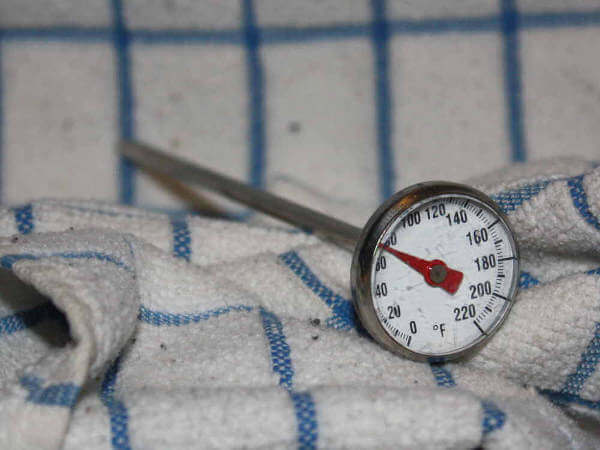 There's no getting around the need to have an accurate thermometer available when smoking meat. It's important. It's crucial. If you don't have a good thermometer, you might as well just pack your smoker away in storage and live on Big Macs and fries. At minimum, you should have a handheld thermometer. An analog dial type will work, but they are very slow to respond. Digital handhelds provide a quicker reading, with some being very fast. The ThermoWorks Mk4 is a professional grade handheld that's gives an accurate reading in just 2 or 3 seconds. That's fast! If you don't want to have to open up the smoker every time you check meat temps, pick up an inexpensive wired single-probe thermometer. The meat probe is connected by wire to the display unit that sits outside the smoker. Hopefully your smoker has a mounted thermometer that's been tested for accuracy, and it's been verified to match the actual temperature inside the smoker. Dual Probe Smoker Thermometers Make Things a Lot Easier! A step up from that would be a dual probe smoker thermometer, most of which include a remote unit that display both the smoker temperature and the temperature of the cooking meat. With one of these you can sit in your lawn chair, well away from the smoker, and keep an eye on the temperatures. Some of these have enough range and signal power that you'd be able to step inside and watch the game... all the while monitoring the smoker and meat temps. 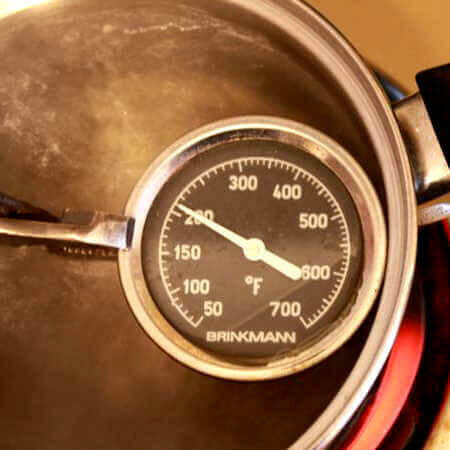 You'll know the precise temperature of meats continuously while cooking. You can use them to monitor the smoker temperature. 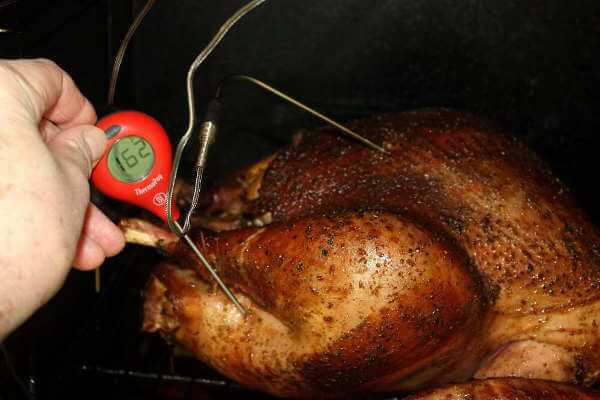 Mounted smoker thermometers are often inaccurate, so by placing a high quality remote thermometer probe inside the smoker, you'll know the exact cooking temperature at all times. 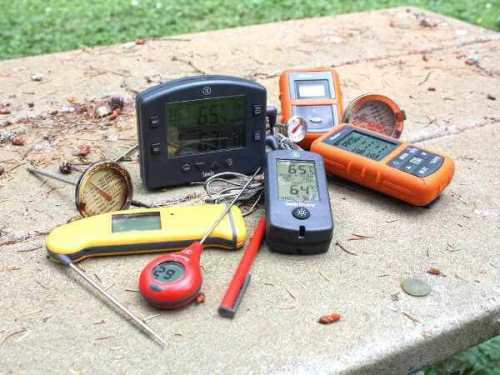 You're allowed the freedom to go about your business as the food's smoking when using a remote thermometer. It sends a wireless signal to a receiver you carry that displays current temperatures. Smoker thermometers continue to evolve, with some making use of the newest technology. Some models transmit a Bluetooth signal that will send temperature and time information directly to your smartphone. There are even Wi-Fi ready smoker thermometers that connect to your home router, enabling you to monitor your smoking meat from your computer... and from your smartphone while on the road. You can make a beer run and still know the temperature of that smoking brisket! You may not need a fancy schmancy dual probe thermometer. Many of the newer digital electric smokers have a built-in probe that measures meat temperature, and automatically keep the smoker temp at a preset level. Even so, they don't give you the freedom of being away from the smoker with the ability to monitor the temperature of the cooking food. And you might be just fine and dandy with that. When you see that the meat's reached its target temperature, it should be ready to eat. Maybe. A large hunk of meat won't reach the same temperature everywhere at the same time. It will typically be cooler in thicker sections and hotter where it's thinner. The meat temperature will also be higher near the surface. That's where a handheld thermometer comes in handy, even if it's a simple dial pocket thermometer. When the fixed-position probe signals that the meat's done, it's wise to use another thermometer to check a few different areas of the meat. A hot probe is difficult to maneuver if you try using it to take several different temperature readings. So to make things easier, I recommend that you have one decent handheld meat thermometer in addition to your smoker thermometer - or the meat thermometer that's built-in to your smoker. 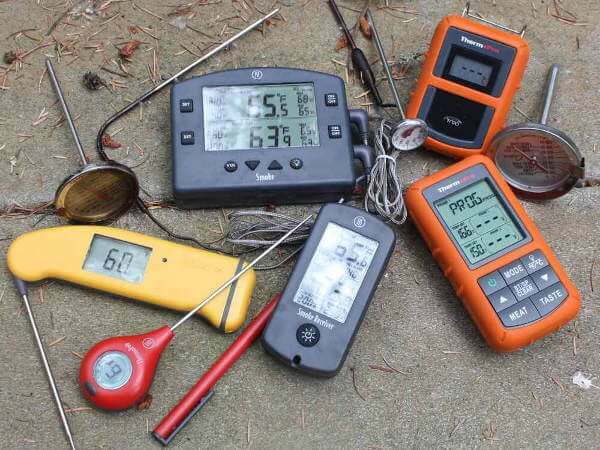 You can get by if you only have a handheld thermometer, but these do present some challenges, especially if you're not yet familiar with your smoker, and how quickly the temperature rises in different types of meat. When spot-testing meats, I use two different handheld thermometers, both made by the ThermoWorks company. ThermoWorks makes a wide variety of high quality thermometers and accessories for all sorts of uses. Many are certified for professional use. Depending on my mood, I switch between using my red Thermopop thermometer and my bright yellow Thermapen Mk4. The ThermoPop responds quickly to temperature, and needs only 4 seconds, more or less, to register the meat temperature. To learn more about the ThermoPop, read my detailed review. 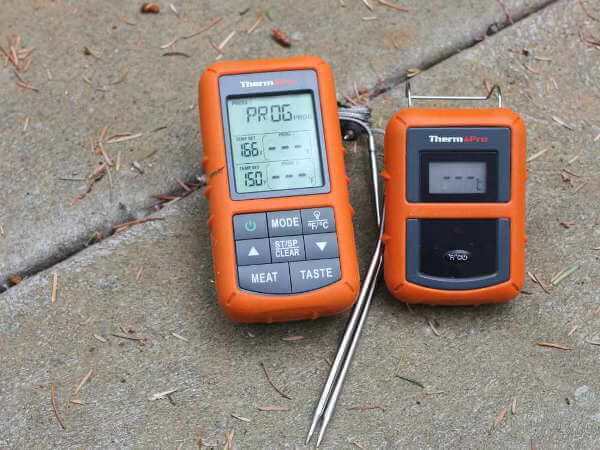 The Thermapen Mk4 is even faster, responding in 2 to 3 seconds. This is one the the thermometers that's certified, so it can be used in professional setting, such as food service and inspections. For chicken and turkey breasts to be cooked perfectly, they have to be cooked to a very precise temperature. Once that temperature is breached, the white meat will quickly become dry and tough. When using a handheld thermometer, the smoker would be opened often to check the breast temperature. And each time it's opened, it cools down, and a lot if you're using a very slow-responding thermometer. With the smoker temperature bouncing around, it makes it really difficult to estimate how much more cooking time that chicken will need. And unless you attempt to stick the probe into the same hole each time, the breast will look like a pin cushion and leak that tasty juice like a sieve! Other meats are sensitive to overcooking. A pork loin is juicy and tender when it reaches the 145˚ to 150˚F range. Rare prime rib, 125˚ to 130˚. Medium-rare beef tri-tips and roasts, 135˚ to 140˚. The flavor, texture and juiciness of any of those will suffer if they go much over those temperatures. 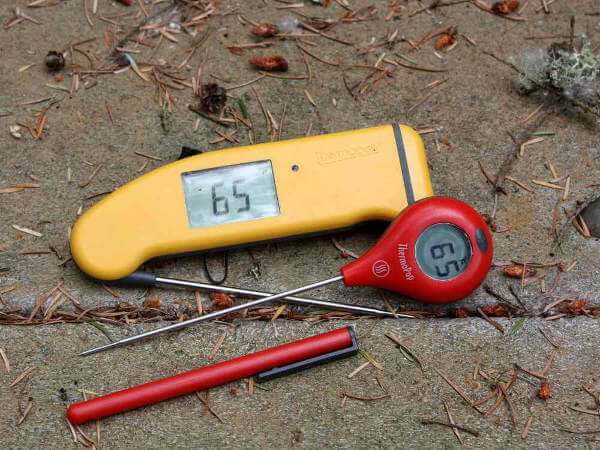 A handheld thermometer will work, but it can be easy to miss the temperature target. The most basic have a single probe, attached by wire to a display unit that is placed outside the smoker. The greatest benefit of these is that you know the internal temperature of the meat, without having to open the smoker. Some of these have a remote temperature display unit that allow you to move away from the smoker. Dual probe smoker thermometers have a second probe that are typically used to measure both the smoker temperature and the meat temperature. 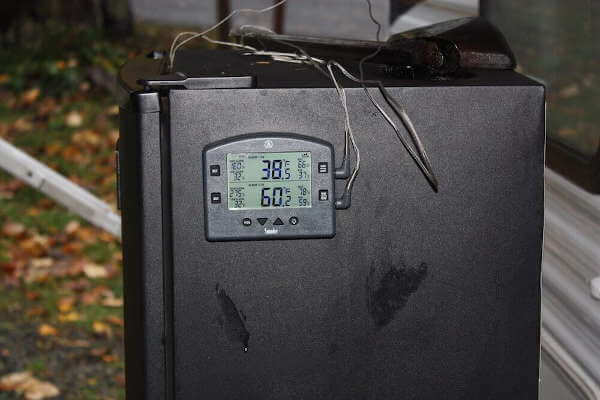 The portable display unit shows both temperatures, as long as it's in range of the sending unit. Most of these thermometers claim a range of 300 feet, although some obstacles can block the signal, shortening the range. Depending on the types of probes supplies with these thermometers, some can be used to keep track of the internal temperature of two different meats, or of two positions in the same piece. This can be handy when cooking whole turkeys and chickens... one probe in the breast, the other in the thigh. However there's at least one smoker thermometer I'm aware of that has a probe that's specifically designed to measure air temperature. It is rather large in diameter and has a flat end, and wouldn't work as a meat probe so measuring dual meat temps is out of the question. That is, unless you order a second food probe to use in place of the air probe. It's surprising to know how many different bugs can cause bacterial food poisoning. My go-to smoker thermometer is a ThermoWorks Smoke that I've have for the last year. It's accurate, and built like a Mack truck! The components are heavy duty, and its performance is flawless. If I have two smokers going, I also use my ThermoPro TP20 . It has some nice bells and whistles, and although not as sturdily built as the Smoke, it hasn't given me real problems. The nice thing about this one is that its two probes can both be used for measuring meat temperature, not possible with the Smoke as it comes from the factory. Usually mounted on the lid or cover of the grill or smoker, these indicate the approximate temperature of the interior cooking area. However since it isn't at the same level as the food, they tend to give an inaccurate reading. 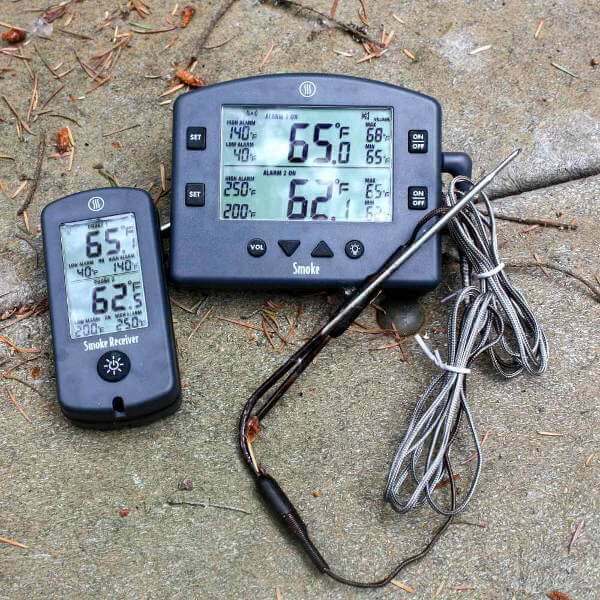 The following page explains how to mount a thermometer on your grill or smoker.